Scientists at the Oregon Health & Science University and the AIDS and Cancer Virus Program of the Frederick National Laboratory for Cancer Research have used a novel vaccine approach to achieve a “functional cure” and apparent eradication of infection with a monkey version of the AIDS virus. In a paper published online in Nature, the group reported success with an experimental vaccine for simian immunodeficiency virus (SIV), an AIDS-inducing virus that infects rhesus macaques and is so similar to HIV that it is a widely used model for AIDS studies in monkeys. Vaccinated animals that were experimentally infected via rectal, vaginal, and intravenous routes—the principal routes of HIV transmission—were able to control the infection with a highly pathogenic strain of SIV, reducing the amount of virus in the blood to below detectable levels. After up to three years of follow-up, the investigators were unable to demonstrate the presence of SIV, despite extensive analysis of many necropsy tissues, using ultra-sensitive, state-of-the-art assays. To further investigate the apparent clearance of infection, the investigators studied several animals in detail, taking repeated tissue samples from the animals, starting as soon as they first showed evidence of controlling the virus. Results showed they were definitely infected, with clear initial evidence of virus in the sampled tissues. The animals also developed new immune responses against parts of SIV that were not included in the vaccine. Over time, however, the scientists could no longer detect evidence of the virus or culture it, or measure the new infection-dependent immune responses. In contrast, immune responses induced by the vaccine remained robust and stable. Perhaps most dramatically, when investigators transferred large numbers of cells to new uninfected animals, using cells from infected donors that were either rare animals that showed spontaneous control of SIV infection, or animals receiving suppressive antiretroviral drug treatment, the recipients rapidly showed evidence of high levels of infection. In striking contrast, using the same cell transfer procedure from vaccinated animals that appeared to have cleared their infections, there was no evidence of infection in the recipients over extended follow up. The milestone, published in Nature this week, is the latest step in an ongoing line of collaborative research in which the investigators have been testing a new approach for developing an AIDS vaccine. This approach harnesses the cytomegalovirus (CMV), a member of the herpes virus family, taking advantage of the unique immune responses induced by this virus. By inserting genes from SIV into the rhesus macaque version of CMV, the investigators have induced immune responses against the inserted SIV targets that have the unique characteristics of immune responses induced by CMV. Specifically, the CMV/SIV vaccine did not stimulate a significant antibody response, but did cause a T-cell response against SIV that was very strong, very broadly targeted, and indefinitely persistent. The response involved the two main subsets of T lymphocytes responsible for many antiviral immune responses, both CD4+ T cells and CD8+ T cells. Conventional vaccines stimulate a T-cell response that eventually contracts into a small number of “central memory” cells. These memory cells must be re-exposed to an infectious agent before they can re-expand their numbers and acquire the functional properties necessary to mediate effective antiviral responses. On the other hand, T-cell responses induced by the CMV/SIV vaccine result in a large number of indefinitely persistent “effector memory” cells, which can immediately fight infection and are widely distributed throughout the body. The mechanism by which the CMV/SIV vaccine stimulates the immune systems to achieve effective control of SIV infection is highly unusual, and details of this mechanism were reported in the May 24, 2013, issue of the journal Science by the same research team working with the same experimental vaccine. This research showed that about one-third of vaccine-induced responses by CD8+ T cells were typical, but two-thirds were highly unusual. These unusual vaccine-induced responses targeted parts of SIV proteins that are not typically recognized by responses to either SIV infection or conventional SIV vaccines. These unconventional CD8+ T-cell responses appeared to be induced by the immune system presenting the targets of the responses via a cell surface molecule usually used to present targets to CD4+ T cells. This unusual targeting of the vaccine responses, along with the ability to recognize large regions of the SIV proteins, and the indefinite persistence of the responses appear to combine to make for a unique and highly effective response, capable of not only controlling a highly pathogenic AIDS virus, but also, apparently, clearing the infection. 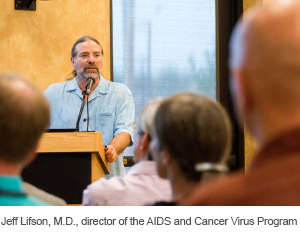 The current research published in Nature, as well as the earlier work in Science, was led by Louis Picker, M.D., Oregon Health & Science University (OHSU), and Jeff Lifson, M.D., director of the AIDS and Cancer Virus Program (ACVP), Frederick National Laboratory for Cancer Research (FNLCR). The two papers are part of a longstanding and ongoing collaboration between the groups (see references below). The collaboration is both complementary and synergistic, benefiting from the cutting-edge immunology expertise of the OHSU group and the corresponding virologic expertise of the FNLCR group, with both having extensive experience in the use of nonhuman primate models for AIDS-related research. The collaboration has benefitted from the unique infrastructure capabilities established within ACVP, which include the program’s Tissue Analysis Core, headed by Jake Estes, Ph.D., its Viral Evolution Core, headed by Brandon Keele, Ph.D., and its Quantitative Molecular Diagnostics Core, headed by Michael Piatak, Jr., Ph.D., all of whom made key contributions to the current publication (see sidebar). As part of part of its commitment to the mission of FNLCR as a national laboratory, ACVP makes the unique capabilities of its cores available to outside investigators through multiple collaborative and partnering arrangements. The investigators plan to next test the CMV-vectored vaccine as a “therapeutic vaccination” approach. In their studies to date, animals have been vaccinated first, and then infected with SIV. The ability of the vaccinated animals to control the infection has been followed, leading to the observation that vaccinated animals appear to clear the infection over time. For the therapeutic vaccination study, the investigators will take monkeys already infected with SIV, administer antiretroviral drug treatment to suppress the virus, and then vaccinate the animals. The hope is that the unique vaccine-induced responses will eliminate over time the residual virus that is known to persist in the face of apparently effective antiviral drug treatment. After an extended period of careful monitoring, if there is evidence suggesting possible clearance of the infection, the antiretroviral drug treatment will be stopped. The animals will be monitored to determine if the virus comes back, as it inexorably does in non-vaccinated animals, even after extended periods of antiretroviral drug treatment. While these additional animal studies are proceeding, a parallel effort is under way to develop candidate vaccines based on the approach for clinical evaluation. Since CMVs are species specific, the rhesus CMV tested in monkeys will not work in humans; fortunately, the overall genetic organization of human CMV is similar enough to the rhesus virus that making comparable vaccine vectors is relatively straightforward. A key consideration in developing a vaccine for clinical testing will be safety, since in contrast to most vaccines, which are eliminated from the body after inducing the desired immune responses, the CMV-based vaccine will persist, and its persistence is important for it to maintain its unique properties. While CMV can cause harm when the infection is a congenital one, or in individuals with compromised immune systems, about 80 percent of Americans, depending on age, are already naturally and persistently infected with CMV, and in healthy individuals, the virus does not cause clinically significant problems. Indeed, CMV’s ability to persist in the body indefinitely without causing harm was one reason for its attractiveness as a vaccine vector. The CMV vector used for clinical testing will be attenuated as an additional safety measure, and initial studies will be done in individuals who are already naturally CMV infected, a scenario in which the incremental CMV viral burden from the vaccine will be negligible. Interestingly, prior natural infection of monkeys with rhesus CMV does not impact the ability of the rhesus CMV-based SIV vaccine to induce strong immune responses to the included SIV targets. The current publication is an important and encouraging milestone for AIDS vaccine research. Much of the field is focused on efforts to develop vaccines capable of inducing antibody responses for neutralizing the very diverse range of HIV variants circulating in the global pandemic, with the intent of preventing infection in people who are vaccinated. While investigators have isolated individual antibodies from chronically HIV-infected individuals that have the desired properties, coming up with a vaccine capable of inducing such antibody responses in uninfected people has proven to be a daunting task. Demonstration in the current publication of a vaccine that induced T-cell responses able to control even highly pathogenic strains of SIV represents real progress along another axis of potential vaccine efficacy. The unprecedented breadth of the vaccine-induced T-cell responses suggests they may be effective against the range of viruses circulating in the pandemic. Finally, the observation of apparent clearance of SIV infection also offers hope that, if this effect can be reproduced by a therapeutic vaccine, suppressive antiretroviral drug treatment may not need to be maintained for the lifetime of infected individuals, with all the associated societal, personal, economic, and other costs. Hansen, et al., Nature 2013 Sep 11 (online). doi:10.1038/nature12519. Hansen et al., Science 2013 May 24;340(6135):1237874. doi: 10.1126/science.1237874 . Fukazawa Y et al., Nat Med. 2012 Nov;18(11):1673-81. doi: 10.1038/nm.2934. Epub 2012 Sep 9. Picker LJ, Hansen SG, Lifson JD, Annu Rev Med. 2012;63:95-111. doi: 10.1146/annurev-med-042010-085643. Epub 2011 Sep 19. Hansen et al., Nature 2011 May 26;473(7348):523-7. doi: 10.1038/nature10003. Epub 2011 May 11. Hansen et al., Nat Med. 2009 Mar;15(3):293-9. doi: 10.1038/nm.1935. Epub 2009 Feb 15.